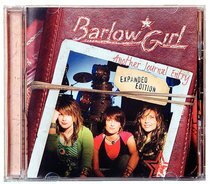 BarlowGirl's Another Journal Entry quickly garnered national attention with both 'Let Go' and 'I Need You To Love Me' hitting #1 at radio. Now BarlowGirl brings their fans the ultimate jam packed album. In addition to the original eleven tracks, Another Journal Entry Expanded Edition features 5 new songs, 3 music videos including the brand new 'Never Alone' video, additional home video, pictures, and exclusive content! About "Another Journal Entry: Expanded Edition"